A man was caught with indecent images of boys at his home which had a room decorated like a 1960s classroom. Police seized a Dell laptop which contained 576 indecent images of children when they searched Philip Ritchie’s house. Many of the photographs on the 57-year-old’s computer showed boys posing in swimming trunks. And officers who searched Ritchie’s home in Banff also uncovered school uniforms in adult sizes along with three rooms – one decorated to look like a 1960s classroom, another a toy room and another a 1950s boy’s room. 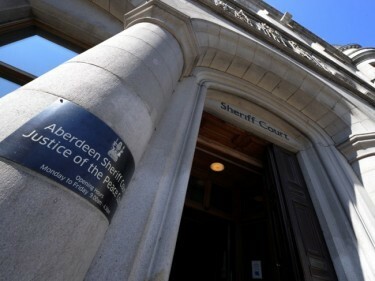 When Ritchie appeared at Aberdeen Sheriff Court, fiscal depute Stephanie Ross said: “Officers attended to execute the warrant and were allowed entry by the accused and he was cautioned and detained. “A search was conducted and various devices recovered. “A Dell laptop was found to contain images of young boys posing in swimming trunks. She added Ritchie told police outside of interview that it was his “lifestyle”. The court heard a total of 576 indecent images of children were found, around 560 of which were classed as category C.
Ritchie pled guilty to taking, permitting to be taken or making indecent photographs or pseudo-photographs of children between November 4, 2016 and June 20, 2017. Defence lawyer Graham Morrison, representing Ritchie, of High Street, Banff, asked for his sentence to be deferred for reports. Sheriff Jack Brown deferred sentence on Ritchie until next month for a criminal justice social work report to be prepared.